Gotta Run, My Portfolio is on Fire! By the time you read this, the market will have closed out another volatile trading day. This is all follow-through from Wednesday, when the market took a plunge off a cliff into the biggest sell-off since February. This raises the question, what should you be doing now? How do you preserve wealth? How can you potentially profit? 1. Despite new trade agreements with Canada and Mexico, our trade tiff with China seems to be getting worse. This is scaring the Bojangles out of tech stocks of all types. 2. Yields on the 10-year Treasury note are zig-zagging their way higher. On Tuesday, the benchmark maturity topped 3.25% for the first time since 2011. Today, it was still high at 3.16%. Why is this important? Because a 5% yield on the 10-year is a dividing line where many in the market see stocks losing their attraction. Indeed, President Trump tried to coax the Fed out of hiking interest rates so quickly. Stick a wig on me and call me Patsy Cline, but I don’t think a few interest-rate hikes will mean that much in the grand scheme of things. It just shows how skittish traders and investors — and our president — are right now. But interest rates aren’t the market’s only concern. 3. 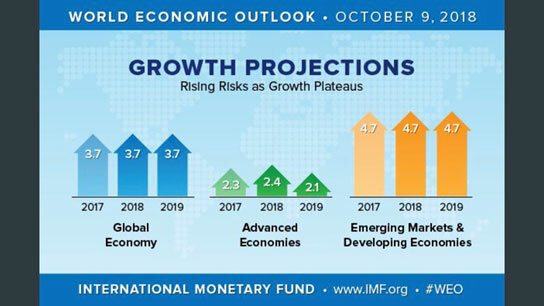 The International Monetary Fund has lowered its forecast for global growth slightly, shaving 0.2 percentage points for 2018 and 2019. Despite the fact that the IMF is terrible at growth predictions, the market took this as a “sell” signal as well. This shows how easily spooked investors are now. For example, as I explained in my Tuesday column, China is buying so much copper now that prices are soaring. Codelco has nearly sold out of its 2019 copper inventory. And have you seen oil prices lately? They’re trending much higher. That’s not what you see when the economy is cooling down. Nonetheless, the cycles have turned against the bulls, at least in the medium term. That’s the bad news. Now, how can you make money? The really good news is that gold and gold stocks are acting like the safe havens they are. They’re going higher. The positive movers in my subscribers’ portfolios are mostly gold miners. In fact, let me show you gold miners in a way you usually don’t see them. Here’s a chart of the VanEck Gold Miners ETF (NYSE: GDX) divided by the price action in the SPDR S&P 500 ETF (SPY), which tracks its namesake index. 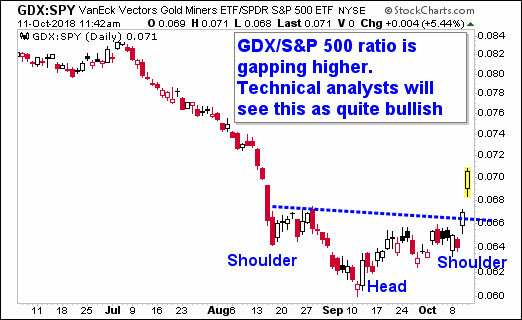 Gold miners are so strong, and the S&P 500 is so weak, this ratio is gapping higher. Technical analysts would look at that and see an inverse head-and-shoulders pattern. One with at least another 10% upside. In other words, gold miners should continue to outperform the S&P 500 — and probably the other major indices — in the short term. So, if you want to stick money somewhere to protect your wealth and potentially profit, consider individual miners. Or just buy the GDX. After all, I’ve written one analysis after another after another showing why fundamentally bullish forces are lining up for gold and miners right now. I meant every word. And gold got so stretched to the downside, the next move higher could be a rocket ride. Heck, it could be downright glorious. You’ll have to make your own decision, and do your own due diligence before buying anything. Even if you don’t buy gold miners, use a pullback like this to sell laggards, and bank those profits. There’s nothing wrong with grabbing gains — heck, that’s what I just told subscribers in my Wealth Supercycle to do. Because you know what follows a sell-off? As sure as day follows night, we get to a great buying opportunity. And you want to be ready for that, with cash in hand. dr. Weiss and Tony are short term looking at a melt up and long term negative. Please clarify.